Trailing 40-36 early in the second half, the Portland State Vikings dominated Idaho State for the remainder of the game and won their Big Sky Conference opener 63-49 Thursday at the Stott Center. Lateef McMullen matched his career high with 20 points and had four assists and four steals to lead the Vikings, who improved to 3-5 overall heading into a home game with Weber State Saturday at 7:30 p.m.
"This is probably the best half we've played," Vikings coach Tyler Geving said. "The guys stepped up when they needed to possession by possession. Now, we just have to keep that up Saturday against Weber State." Idaho State, which entered the game as the lowest scoring team in the nation, dropped to 1-8 overall. The Bengals broke free from a 28-all tie at halftime to lead 40-36 with 15 minutes left, but the Viks took back the lead with a five-point play that included an offensive rebound from a missed free-throw, basket and free throw by McMullen for a 41-40 lead. McMullen hit 7 of 9 shots from the field. For the game, the Vikings shot .532 from the field (25-47), while the Bengals shot .468 (22-47). PSU hit 7 of 13 (.538) three-point attempts, including 3-5 by Michael Harthun. 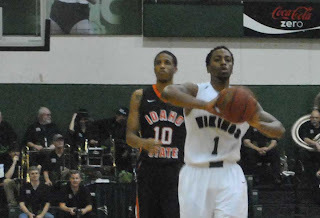 Portland State out-rebounded Idaho State, 29-22. Weber State enters the game at 5-3 and 1-0 in conference play.